Easter Penalty Rates for 2018 | Get your FREE Tanda trial now!Easter Penalty Rates for 2018 | Get your FREE Tanda trial now! Wondering what penalty rates apply to your staff this Easter? We’ve got your back. According to Fair Work, these are the 2018 public holidays that apply to states and territories: QLD has declared Easter Sunday as a public holiday since 2016. “Declaring Easter Sunday as a public holiday recognises its religious and cultural significance and ensures that workers required to work on that day are treated the same as they would be if they worked the Good Friday, Easter Saturday and Easter Monday public holidays,” Industrial Relations Minister Grace Grace said in an official statement. Changes in Awards and Public Holiday Penalty Rates The Fair Work Commission introduced overtime for casual employees to several Modern Awards, including Retail and Hospitality Awards. Businesses need to be more careful when rostering casual staff, ensuring that they are not being accidentally rostered into overtime conditions. These changes affect six Modern Awards where casual employees are common, and failure to comply come with heavy penalties. These changes apply to the following: Hospitality Industry (General) Award Restaurant Industry Award General Retail Industry Award Fast Food Industry Award Hair and Beauty Industry Award Registered and Licensed Clubs Award If you require an employee to work over the Easter period, double check the impact of public holiday penalty rates on your wage costings. For example, full time and part time staff under the General Retail Industry Award are entitled to an additional 125% of their base rate, while casual staff are entitled to 150% of their base rate. 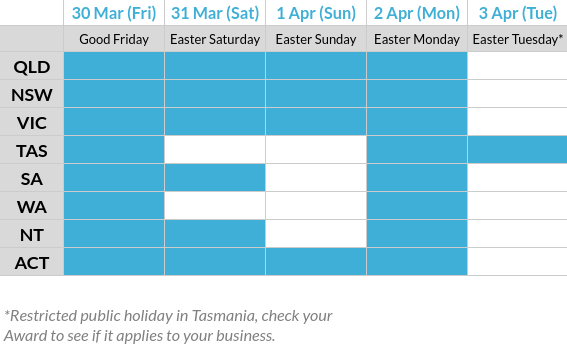 Tanda automates public holiday calculations, making it easy to figure out additional costs for your staff working on public holidays. Rates automatically apply according to their location, Award, and the type of employee you’ve rostered to work. If you have any questions about how Tanda automates public holiday pay, visit our Help Centre or email us at employees@tanda.co. Wondering what penalty rates apply to your staff this Easter? We’ve got your back. QLD has declared Easter Sunday as a public holiday since 2016. “Declaring Easter Sunday as a public holiday recognises its religious and cultural significance and ensures that workers required to work on that day are treated the same as they would be if they worked the Good Friday, Easter Saturday and Easter Monday public holidays,” Industrial Relations Minister Grace Grace said in an official statement. If you require an employee to work over the Easter period, double check the impact of public holiday penalty rates on your wage costings. For example, full time and part time staff under the General Retail Industry Award are entitled to an additional 125% of their base rate, while casual staff are entitled to 150% of their base rate. Tanda automates public holiday calculations, making it easy to figure out additional costs for your staff working on public holidays. Rates automatically apply according to their location, Award, and the type of employee you’ve rostered to work. If you have any questions about how Tanda automates public holiday pay, visit our Help Centre or email us at employees@tanda.co.